Nomadik has just released a spoiler for their February box! The theme for February is “Multi-tasker”! This $40 multi-tool is anything but ordinary. With 18 functions, an ergonomic handle, locking system, 1/4″ bit driver, and included bits – nothing on the market compares. 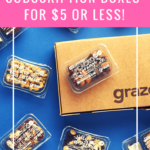 Order by 2/11 to receive the February box. How much is this monthly? Oooh, I hope this a good one. I haven’t heard of this brand and could only seem to find 1 review. Love multi-tools thought.